If you are looking for information on the Monkey Joe's franchise business opportunity, Monkey Joes franchises or Monkey Joe's franchising, then you have come to the right place. Monkey Joe's is an indoor play center for kids aged 2 -12 with exciting, inflatable slides, obstacle courses & jumps and party rooms for all occasions. 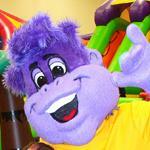 The success of the Monkey Joe's concept is built on Raving Brand's time-tested tactics used in other hot franchise concepts such as Moe's Southwest Grill and Planet Smoothie. With unbeatable support, tools and assistance, let the expertise that Raving Brands provides catapult you to the top of the industry. Our purpose at Monkey Joe's is to encourage a healthy lifestyle through fun exercise in a safe, indoor play center for kids aged 2-12. While kids learn the value of exercise and getting along with others, they can enjoy wild, inflatable slides, obstacle courses and jumps and party rooms for all occasions. Parents can enjoy flat screen TVs and wireless high-speed Internet access in the comfortable parent area while the kids play their way to a healthy lifestyle. Monkey Joe's is the destination that provides an active alternative to TV or video games, a way for kids to burn off that extra energy or a fun outing for the whole family. Our success doesn't stop with Monkey Joe's! Raving Brands offers a diverse portfolio of exciting brands that are defining the fast-casual industry which includes Moe's Southwest Grill, Mama Fu's Asian House, Doc Green's Gourmet Salads, Boneheads, Shane's Rib Shack, PJ's Coffee, Planet Smoothie, and the Flying Biscuit Cafe. We have created a new kind of business. Our goal is simple and straightforward - to create a world of Raving Fans and we're always on the lookout for partners who can help us make this vision a reality.